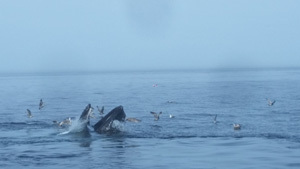 and a free cape ann whale watch ticket included! 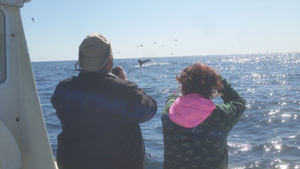 Join Captain Nick aboard the New Lady D, for the Ultimate Whale Watch! Get down to there level in our smaller boat! Our new boat, the Lady D, is a 35` T Jason with a 440hp Yanmar diesel engine that travels up to 20 knots for an exciting ride out to see the gentle giants. We like to leave early and get out to the whales before the whale watch boats get there. 7am or earlier is the best time for whale activity. This vessel has a stand up bathroom. Click here to see pictures of the boat. Your trip is led by Captain Nick Danikas, who started his career at sea as a commercial sword fisherman and herring seiner. 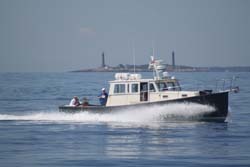 He became a coast guard licensed captain in 1983 and has owned and operated commercial whale watch companies since then. 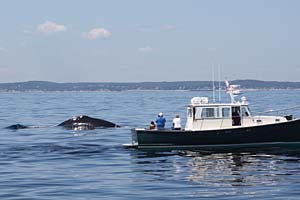 Nick is a partner and Captain of Cape Ann Whale Watch, and has personally led over 4000 whale watch trips. This trip is weather and sea conditions dependent and available April through October. Private 6 Passenger Boat for Fishing, Personal Cruises, Beach Trips or Custom Design Your Own Cruise! Camera. Don’t forget to charge your battery and bring an extra memory card! Sweater or jacket. Even on a warm day. It’s always 10-20 degrees coolers out on the water. Wear sneakers or rubber soled shoes. No heels, please! Wear comfortable, sensible shoes. Sunglasses. 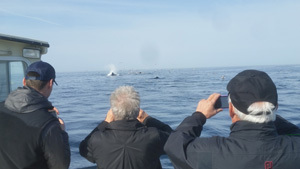 Polarized sunglasses are the best for whale watching because they reduce the glare and help you see into the water better—thus seeing the whales better.